You have come to the right place if you are looking for fun, engaging and exciting Letter D activities to do with toddlers, preschoolers and kindergartners. Our activities are widely used by teachers, moms, dads, child care providers etc. for learning and teaching while being fun for the kids! 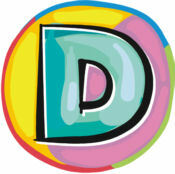 Make a large block letter D on a sheet of construction paper and have the children cut it out. Then taking pictures from magazines, have the children glue objects that begin with the letter D on the large D.
If you have a dime rubber stamp, use it to make dime prints (heads and tails) all along a letter D cut from light-colored construction paper. Invite the children to look at the dime prints and describe what is on each side (use large Dime). Designer belts Have long rolls of paper to go around each student’s waist. Using cut out shapes, the students will follow a pattern on the belt. When completed allow the students to wear their belts. Have children create a necklace using diamonds and straws. Copy large D shapes onto construction paper. Have children use q-tips and paint to make dotted Ds. Children decorate letter D shapes with dots made with a hole punch. Takes time, but it helps build up the strength in those little hands. Print a large D on a piece of paper for each child. Place the papers, a capital D stamp, stamp pad, and markers at the writing center. Invite students to use the stamp and markers to turn their D into a “D dinosaur.” Have them color their dinosaurs and take them home. Have children fold a long strip of construction paper accordion style. Ask each child to cut out D-pictures from magazines and glue them to the accordion sections. Have students design and cut out a dog’s head, feet, and tail and attach them to the paper accordion to make a D-dachshund. Cut out and decorate paper dolls to form a multi-cultural garland, decorate with crayons, markers or paint. If done on a poster-board, decorate sections with scrap material, rickrack, buttons, yarn, etc. Cut paper towel tubes into various lengths. Paint each tube a different color. Glue the tubes (grouped in a bunch – 4-5) to a piece of painted corrugated cardboard. Use to hold pencils, rulers, paint brushes, scissors, etc. For the body, remove the side of a paper towel with scissors to make sort of a well. Cover the tube and only one end with construction paper. For the head, cut a circle of paper 5″ . Cut a 1/3 wedge out of the circle. Fold the remaining 2/3 into a cone shape and tape together. Tape the head to the body. Add paper ears, draw on eyes, a mouth and a nose. For the tail, glue a piece of chenille stick to the covered end of the tube. For legs attach 4 small corks with glue. Cut sponges into the shapes of tyrannosaurus dinosaur footprints. Fold paper towels in half and place them in shallow containers. Pour a small amount of brown tempera paint on top of each towel. Give the children crowns cut out of construction paper. Let the children cover their crown with dinosaur footprints by pressing the sponge stamps first into the paint and then onto their papers. When the paint has dried, write”tyrannosaurus (child’s name)” on the front of each crown. Have the children cut out a circle and glue it to the center of a paper plate. Show them how to cut petals in a variety of colors and glue them around the circle to form a daises. Have the children add stems and leaves. Ask the children to draw and color large pictures of their dads (or another important male figure in their lives). Have them tell you something special about their dads to write down on the pictures. 1 cup flour, 1/4 cup sugar, 1/4 cup salt, 3/4 cup water, food coloring Mix all together and put in squeeze bottle. Drizzle on paper, or on a hot day – your friends! Cut out pictures from magazines of dogs and glue them on a poster-board for a dog collage. Make some dinosaur bones out of Clay which hardens. Bury them in a sandbox and go on a dinosaur dig. Another fun idea is to have the children bring things from home that begin with the Letter D. Its fun to see the many different objects that the children bring. (This can be done for any letter, or many other themes.) Have 2 identical bags each with a cord to close the top. Have 2 sets of identical items beginning with the letter D (ex. doll, diamond shape, rubber duck). One set of objects should be put in each bag. The child holds one bag and you hold the other. Put your hand in your bag and select an object, bring it out, say its name (doll) emphasizing the ‘d’ sound. Ask the child to put their hand in their bag and try to find the same object using only her sense of touch – not allowed to look inside. Wash and dry five dog dishes or bowls. Number the dishes from 1 to 5 (may add a doggy as well) by taping numbered pieces of paper to the sides. Set out the dishes and fifteen dog biscuits. Let the children take turns identifying the numbers on the dishes and placing the appropriate number of bones in each one. Variation: Instead of dog biscuit and dog dishes, use small bone shapes cut out of brown construction paper and paper bowls. Objective: Children will match dots/numerals to numerals. How to play the Game: Count the spots on each Dalmatian. Match each Dalmatian to the correctly numbered Doghouse. You can trace an outline of a Dalmatian from any coloring book and add your own spots. Given a dog divided in to 5 sections numbered 0 to 4, have the children count while pointing to each number. After they have identified the numbers the dogs will be cut apart at the divisions. The head of the dog should be placed for the children as a starting point. Then have the children correctly assemble the dog in number sequence. Using “Uno” cards the students will match numbers, colors, and patterns. Print the letter D on an index card and attach the card to an empty drawer. Place the drawer on the floor, along with your D Display Box. Have the children sit with you in a circle. Let one child begin by taking an item from the box, naming it and then placing the item in the drawer. Continue until each child has had at least one turn. Give each student a set of the pages to the little book. Name an object and have the students find the object and put their finger on it (for all objects). Allow the students to color object. Assemble the book. Have each student read their book to the group. Have a picture of a large dog: discuss things dogs do, parts of a dog, what dogs eat, etc. Make construction paper headbands and have the children design the ears they wish to have. Add pictures of dogs to the band. Get a hold of a local kennel club and see if they have “trade” magazines they will be discarding. Cut large doughnut shapes (one for every two children) from different colors of construction paper. Cut each into two puzzle pieces. Mark one piece with an upper case D and the other with a lower-case D. Give each of the children a dough-nut half and have them note the colors and the letters. Then let them walk around to find the matching halves of their doughnuts. May have other halves on the floor or on the board for the students to match. For this activity you will need a realistic picture of a dinosaur, chart paper, and a marker. Show children the picture. Say: “Pretend this dinosaur just walked into the room. Show me what you would do.”Then ask children to describe how they would feel. Say: “Let’s write a story about the day the dinosaur came to our class.” Have children dictate sentences for the story and record them on chart paper. Then read the story back to the children, tracking the words as you do so. Read the story a second time, asking children to point out words that begin like duck. Display the story where children can “read” it on their own. Suggest that interested students illustrate it. Introduce them to the children. Make a domino matching game on paper as a learning game. You have a sheet of paper with drawn dominoes on it. Turn real dominoes upside down and let them find them! Have children pretend to be ducks going in a walk. As they walk, instead of quacking they make the D sound. Walk the neighborhood looking for dandelions. When you find them, help the children to pull them up from their base, getting the roots if you can. The kids will think they are pretty and you will be “weeding” the neighborhood at the same time! Dodge Ball Have the children form a circle facing inward. Choose two or three children to go inside the circle, the other children throw balls into the center trying to touch the inside children. If they are successful, they exchange places with the children they hit. Cut and paste a telephone dial pad and teach the kids to Dial 9-1-1 and/or their home phone numbers. Use 1 package refrigerated biscuit dough. Punch a hole in the middle of each biscuit (a bottle cap will work). Fry in 1 inch of hot oil for about 1 minute or until light brown on both sides (fry the “holes” too). When cool, shake in a bag of cinnamon mixed with sugar, brown sugar, or powdered sugar. 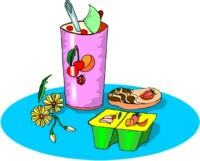 Give each child a small paper cup with 1/2 cup Vanilla Yogurt. Let them measure and crush 1/2 cup of Granola and sprinkle on top for “dirt”. Melt first 3 ingredients together. Stir in cereal. Gently mix until the cereal is well coated. In large grocery bag, place the powdered sugar. Add coated cereal. Shake until well coated and resembling puppy chow. And she said, “Hey kid can’t you plainly see? And I said, ” There’s a hole in my donut too! Cream filled, Peanuts on the top. Long John! Jelly! I can’t stop! Eat them right down to the hole!